Designing the perfect outdoor space for your home is no easy or quick task. Even people who design front and back lawns for a living must work hard to get everything just right. Creating an outdoor space that fits your family, your lifestyle, and your property is fraught with peril. Many homeowners waste money and hours sweating in the sun on landscaping projects and ideas that don’t pan out. 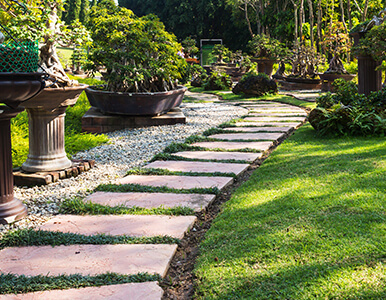 Plan your landscaping based on the space you have. Preparation will save you time and money before you break ground or start buying up poinsettias and young maple trees. Use a blueprint tool. Using software like Sketchup can help you determine the space requirements you’re working with and what your landscaping will look like before you commit to anything. Plant native or compatible trees and shrubs. Your front lawn doesn’t have to match all the native plants in the area, but to avoid costly upkeep and ugly, dead plants, stick with plants that will thrive in the natural environment. Too many lawn ornaments. Those Christmas elves may look cute, but too many lawn ornaments can take away from the beauty of the natural landscape. When considering a new lawn ornament, think about where it would go in your lawn and why it would fit there. Stick with a few, crisp choices instead of littering your lawn with funny frogs and giant stone mushrooms. No recycling system. When you’re mowing your lawn, trimming trees and shrubs, or doing other kinds of landscaping maintenance, dispose of your clippings, branches, and other debris in a sustainable way. 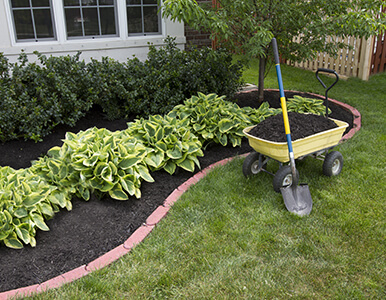 Grass clippings can be a good fertilizer for your lawn, and branches and leaves can be turned into mulch, which can also be used as fertilizer. You could also start a compost pile to create nutritious soil for your garden. Planting in the wrong place. Even if you’ve picked out the right plants for your natural environment, you should still read the plant requirements on the label to ensure you’re putting each plant in a place where it can receive proper amounts of shade and sunlight. Planting trees too deep. Most people think that the more soil they put around a tree when they plant it, the better. Planting a tree too deep in the ground can cause root rot and even choke the tree before it has a chance to grow strong. Cutting the grass too short. Believe it or not, cutting the grass shorter every time doesn’t mean you won’t have to cut it as often. Cutting too close to the ground will expose the grass and its roots to insects and disease. Scalped sections of your lawn could rapidly turn into bare spots. Instead of keeping your lawn mower on its shortest setting all summer, cut your grass at varying lengths throughout the year. In hotter months, the grass needs a bit more shade and blade length to make the most of the moisture it receives. Planning and maintaining your outdoor space can be a full-time job, but if you work smart, not hard, you’ll create a beautiful, natural landscape for your family to enjoy. Take good care of your shrubs and trees and they’ll remain strong and beautiful for years to come. Good luck out there and happy planting!